It's that time of year again for picking blueberries. 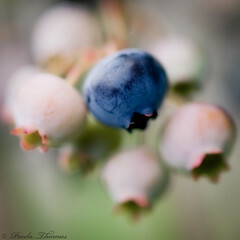 Last year I went to Life Mountain Blueberries in Gold Bar on their last day of picking. They are a certified organic blueberry farm. This year we went to Overlake Blueberry Farm in Bellevue near the Mercer Slough Nature Park. They too are a certified organic farm. The weather this summer has been pretty hot and dry and I'm not sure if this place does any watering or not. There were tons of bushes and several varieties of blueberries. There were also a ton of people picking. They take your driver's license when you come in and they must have had a stack of at least 75 licenses. Parking was hard to come by as well. I'm sure it's much less crowded on a weekday. We ended up with about 4 pounds of berries and paid around $6. Seems like a pretty good deal for organic berries. My parents will be up to visit this weekend and they're wanting to do some berry picking so we will probably go to Life Mountain Blueberries. I heard the berries were a little small and dry due to not much rain but we got some good rain the last week or so and am hoping that will plump up the berries for us. I brought Danbo and Smiley Guy along to help. More pics from our berry picking in Bellevue can be found here.